The cockpit of the 35 Express is a perfect blend of beautiful design and engineering. Ingeniously designed to provide the most space and comfort in a yacht of these dimensions you'll find incredible features not to be surpassed. The large, expansive wrap-around lounge pampers your guests with soft, premium vinyl and distinctive color-coordinated French stitching. For all those cloudless days, an aft convertible sunbed folds down effortlessly giving you the space and comfort for hours in the sunshine. A convenient wet bar features solid-surface countertops and a stainless steel pedestal sink matched perfectly with the cockpit refrigerator and ice marker for entertaining your guests and staying cool. 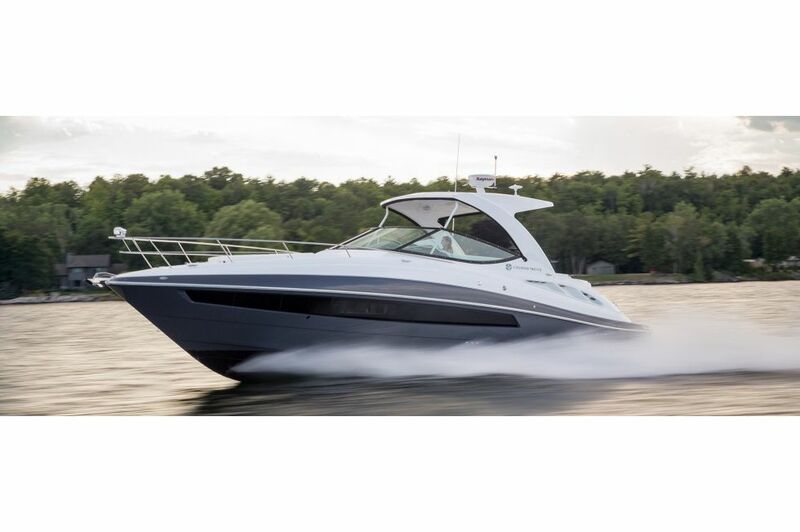 Sleek design, luxurious touches and incredible technology is all found at the helm of the 35 Express by Cruisers Yachts. 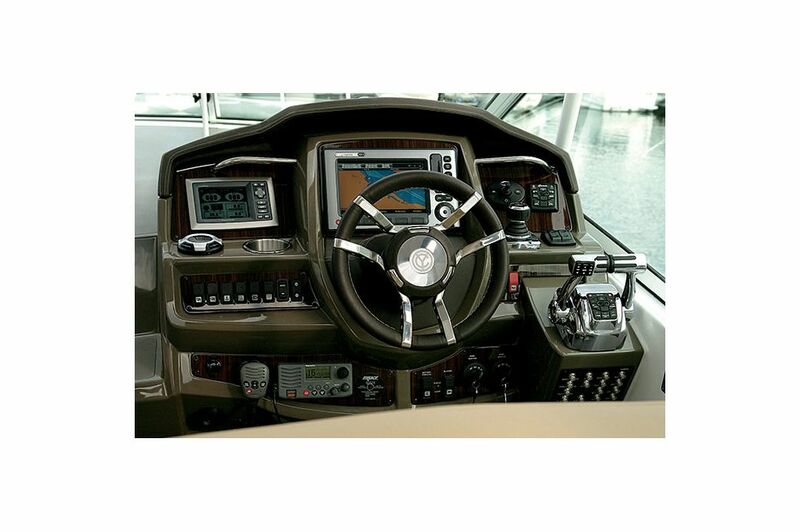 You'll love the stitched leather steering wheel and dashboard and quick access to a large control screen, smart craft vessel view and more. The double wide helm seat gives your co-pilot a comfortable space and gives you a second set of eyes. 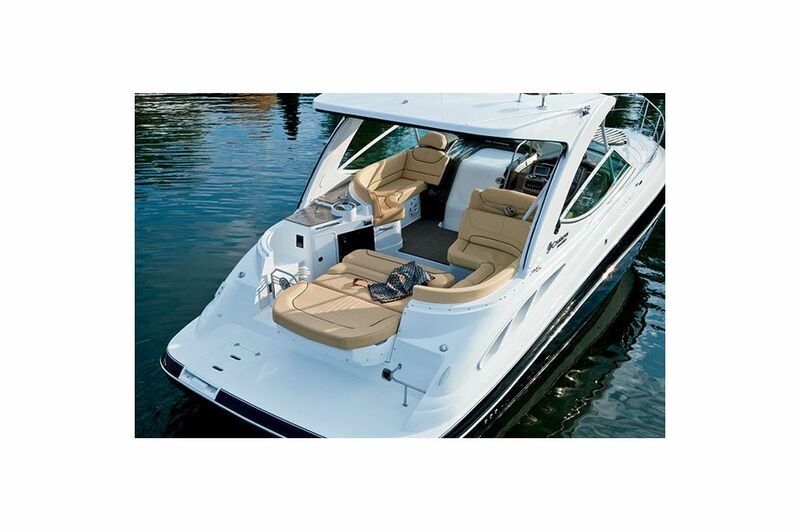 A helm of rich wood grains, metallic ornamentation, stainless detailing, and beautiful leather accent panels. The portside companion lounge is equally impressive, with its ergonomically designed floating headrest and comfortable chaise lounge. Aboard the 35 Express, you'll find incredible light and a beautifully styled salon for you to relax or enjoy company. 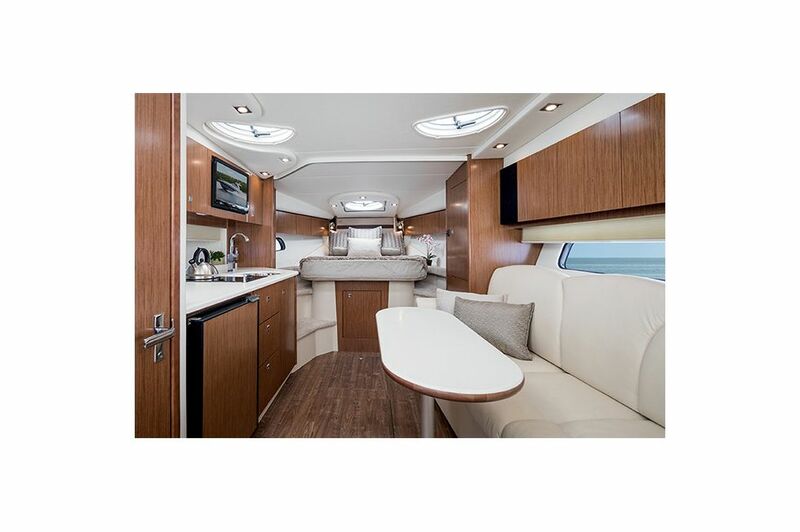 Few new yachts can compete with the salon of the 35 Express with it's design allowing natural light to flood the space and finishing details that deliver a sense of luxurious comfort. With six vertical portholes, you'll always feel connected to the world around you while having the ability to control the temperature of the space with just a touch of a button. The salon also features a dinette table with faux granite countertops, with an accompanying insert for flexible entertaining. 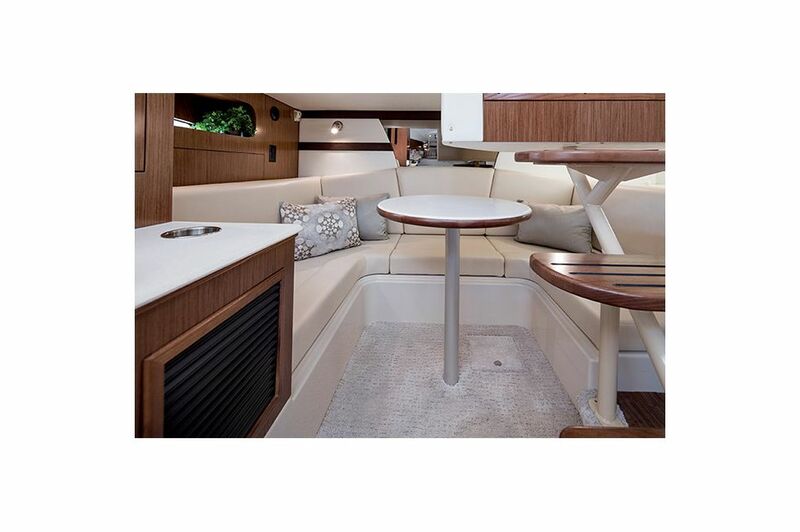 The meticulous detailing of the 35 Express by Cruisers Yachts continues through the galley which delivers the space and design you'll love. Setting the tone with the elegant faux granite countertops, you'll appreciate the deep counter space and vertical ports delivering the light and airy feeling bound to offer a great prep and entertaining space. Appliances include a microwave, refrigerator/freezer combination unit, and a two-burner electric stove. To top it all off, you'll have a flat panel 20-inch LCD TV/DVD which swivels to allow you the flexibility of viewing the TV from the forward stateroom or the salon. The theme of getting more than expected continues on the 35 Express continues to the master stateroom which delivers the space and luxury common amongst much larger yachts. 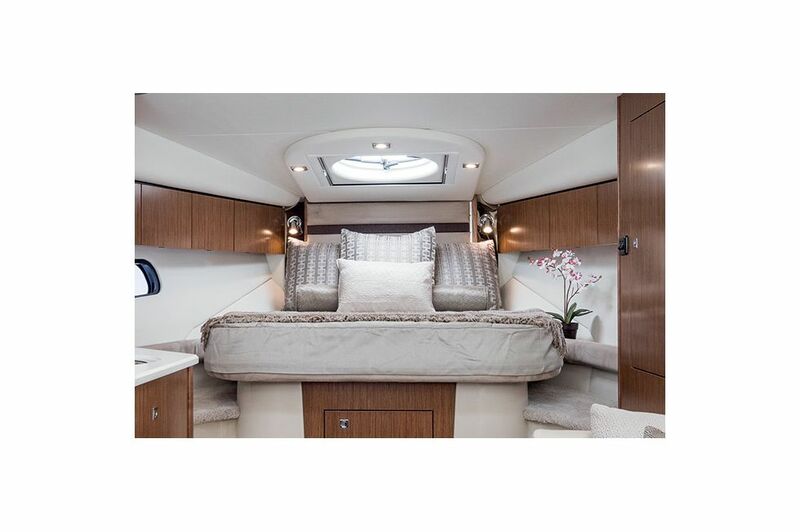 The generous queen-sized island berth has an attractive cushioned headboard for reading or relaxing and allows access from either side. The cabin also includes a privacy curtain and plenty of cabinets and shelves for clothes and storage. You may never miss the comforts of home in the beautiful master stateroom of this yacht. 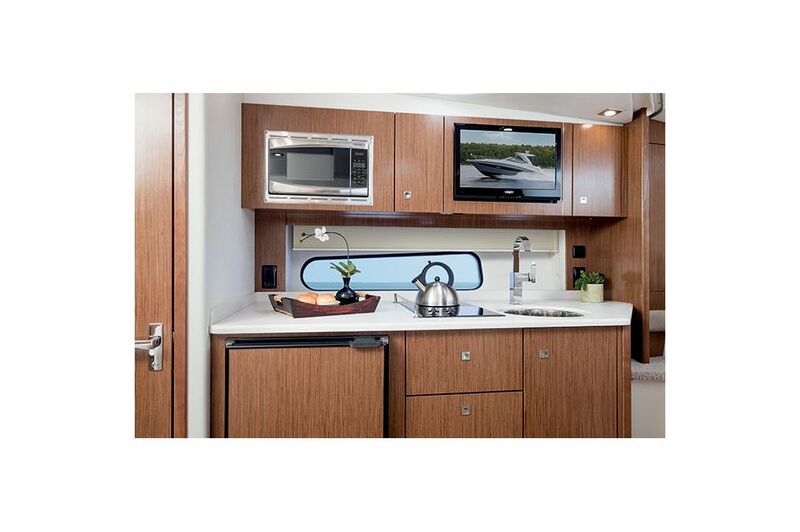 The design and roominess of the master head on the 35 Express gives you everything needed to make this space work for you. 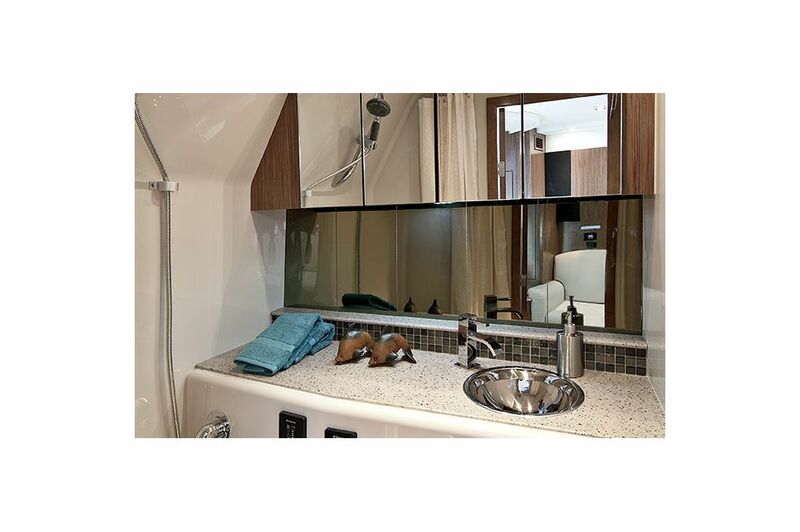 The stacked mirror design makes the space feel larger than it already is, complemented beautifully by the Venetian-style backsplash and wood grain finishes on the storage spaces. 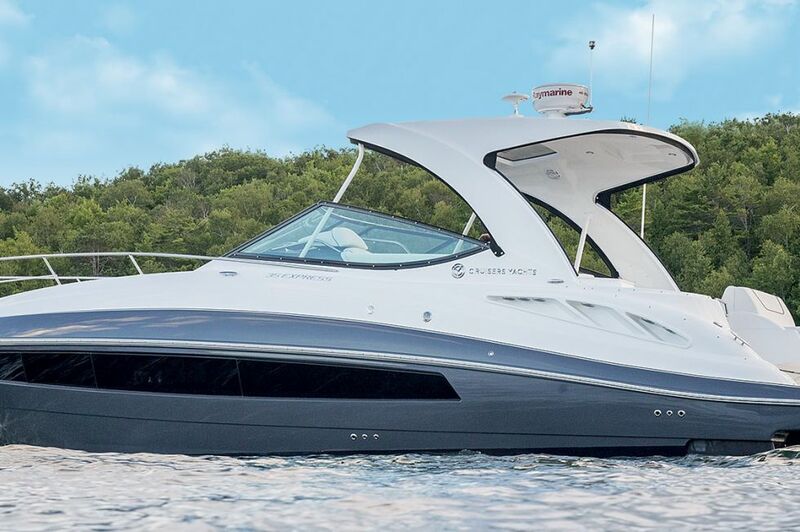 With enough space for a couple of chairs, comfortable floor grip and a convertible sun lounge ready for taking in the sun, you'll love the aft deck of the 35 Cantius. Invite friends to sit with you or take a moment to watch the kids as they play off the stern. 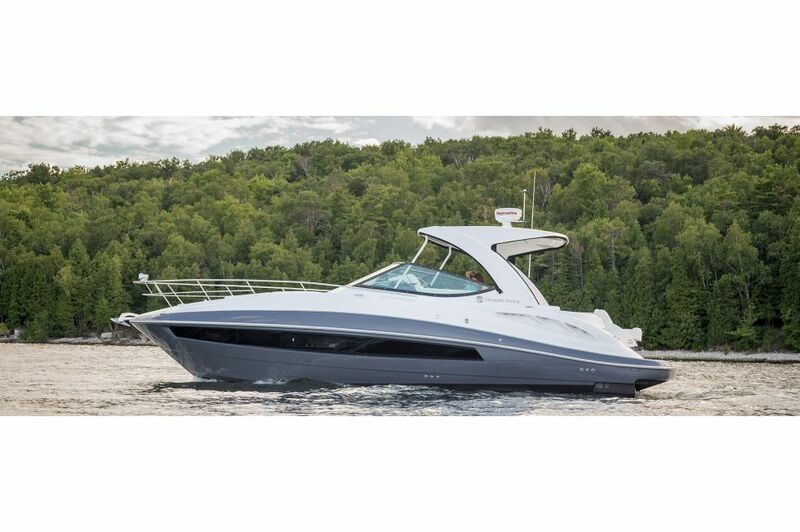 Whatever it is your day brings, love every minute and every inch of the 35 Cantius from bow to stern.